Commercial Grade Vsat solutions are available anywhere on either a Shared bandwidth or Dedicated bandwidth basis. What is commercial grade VSat? Commercial Grade Vsat transmits and receives high quality video and audio data transmissions from remote sites. The service limits the number of subscribers per channel to ensure greater availability and stability. In addition, the service caters for VoIP telephone and VPN services. Commercial Grade Vsat is ideal for large/medium sized corporations, international organisations, governments, military, police services, educational institutions, aid agencies and the like where reliable Internet connectivity is critical to their operations. Shared Bandwidth packages are tailored to provide shared, premium internet connectivity to sites regardless of their location and the terrestrial infrastructure available – anytime, anywhere. The service is optimised for web navigation. The service can also be used with other Internet standard applications such as e-mail, fast file transfer and download. The comprehensive service includes space segment and high-speed, bi-directional internet access for a fixed monthly subscription. Several off-the-shelf packages are available depending on bandwidth capacity needs, the number of PCs connected and application needs. The equipment used to receive the service consists of a fixed, small antenna and an indoor modem which can be connected to a local area network or used in combination with other technologies such as WI-FI etc. World-wide availability – Independent of terrestrial infrastructures. 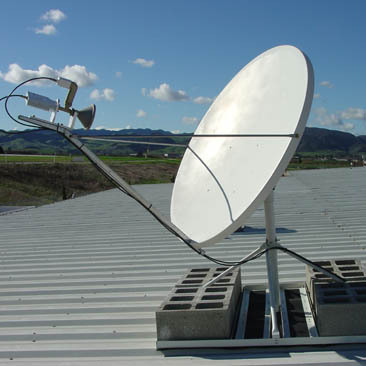 Rapid deployment – Any site within the satellite coverage can be connected to the network quickly. Cost effective and reliable solution. is a reliable, flexible and high-performance two-way satellite solution offering dedicated and guaranteed bandwidth designed specifically to your company’s or closed user group’s requirements allowing you to service your enterprise sites or to create virtual private networks. The service is tailored to customers’ needs and capacity requirements. The main advantage of dedicated bandwidth is its flexibility. Customers can define their own contention ratio and quality of service parameters for sub-groups within fixed capacity contract purchased. Prioritisation can also be done by protocol, IP address, etc. The equipment used to receive the service consists of a fixed, small antenna and a modem which can be connected to a local area network or used in combination with other technologies such as WI-FI etc. Worldwide availability – Independent of terrestrial infrastructures. Rapid deployment – Any site within the satellite footprint can be connected to the network quickly. Efficient and flexible use of bandwidth – the bandwidth can be dynamically shared among closed-user network points. Service provider customisation – can be tailored to client’s specific requirements.